Hi everyone. 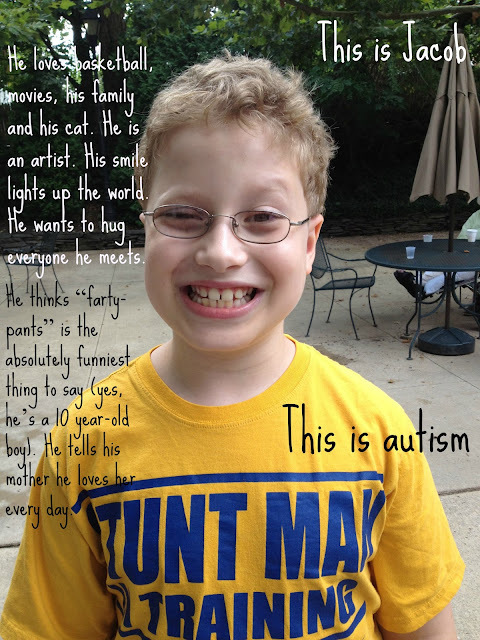 I should have a wonderful new post for you today about autism and my son Jacob. But I don't. Today is the final day of my sons' week and a half long spring break, and I've been too busy being a mom. Today I could have ignored my son Jacob and written a post or spent the day tooling around the city with him, running errands and enjoying his company. You know which way I went with that. You could check out the Autism Shines Facebook page and see the faces of so many beautiful autistic folks. And if you're one of the strangers Jake walked up to yesterday, flashed his sweet smile at and asked to pant like a dog or meow like a cat (then gave a demonstration)? Maybe you're a bit more aware today anyway. If you're one of the strangers who smiled back and obliged him? Definitely accepting. And thank you!